Pleased to work with Sustrans in developing this training course, the FTA is delighted at the uptake to date. Last week saw a new lorry driver course launched in Belfast with the aim of reducing cyclist casualties on roads. 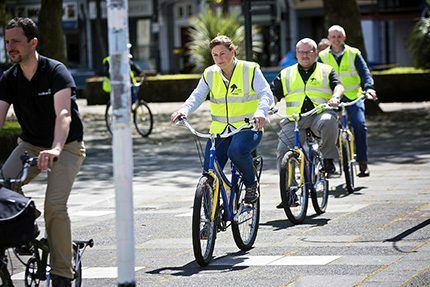 The Safe Urban Driving initiative to improve the safety of cyclists on roads is a joint venture between the Freight Transport Association (FTA) and walking and cycling charity Sustrans in partnership with Cycle Training UK. It is funded by the Public Health Agency and Belfast Strategic Partnership. There were 59 pedal cyclists seriously injured in 2014 in Northern Ireland, which is 17 more than 2013 and is at the highest level since that of 1995 when 68 were recorded. A total of three cyclists were killed in 2014 – two of whom involved collisions with lorries. Having piloted the course with 10 Belfast City Council drivers at the end of June, it is now being rolled out further. Last week’s one-day Driver CPC accredited course saw more drivers get on bikes to experience the road from a cyclist’s perspective. “We represent 14,000 members in the UK who operate over 200,000 commercial goods vehicles which is around half of the UK fleet,” said FTA’s Seamus Leheny. “Our members take road safety awareness very seriously and are working hard to reduce the fatalities involving lorries on the road.